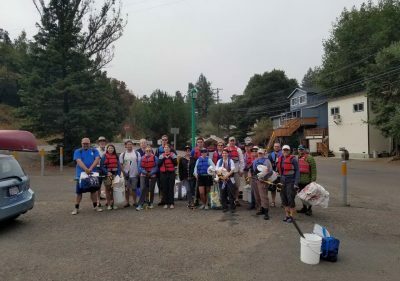 Russian River Watershed Cleanup – What you’re doing! These routes are for all ages and abilities. 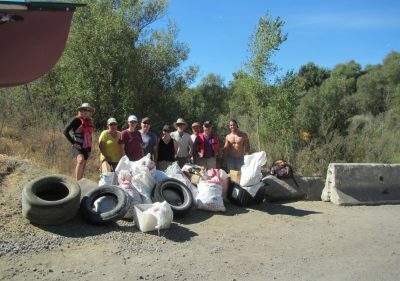 You will walk along pathways, trials, and beaches along well known stretches of the River and find trash in the open areas where it blows into the brush and into campfire rings or along trails. 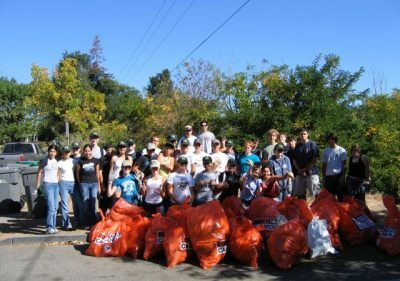 Using your gloved hands or grabbers, (avoid excessive bending and stooping) remove and place in the trash bags anything that doesn’t belong there and should go to the dump like discarded articles of clothing, plastic items, cigarette butts, food wrappers, utensils, fishing line, coolers, etc. Use a second bag to collect bottles, cans, clean paper items or anything that can be recycled so it can be re-used! If you find tires or pieces of tires, electronic items, spray cans, paint or anything possibly hazardous, place it in a separate bag and stack aside from trash and recycling so it can be handled properly. Be aware of safety hazards at all times – see list of common hazards to watch out for! All the trash will be left in a pile on site for trash removal crews to remove later. All unused bags, gloves, pick-up-tools and other gear should be given to your team leader to bring back to the hub for your location on the team leader instructions sheet. 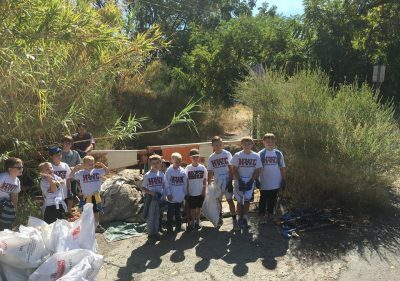 These routes require that you enter the river and/or remove trash from along the shoreline while in the river. 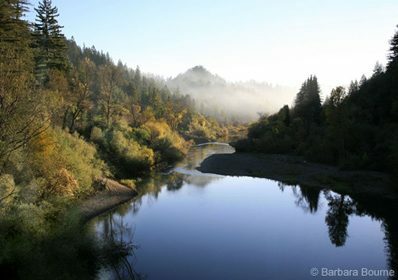 You will be walking upstream and downstream of major recreation areas and campgrounds. You will need appropriate river clothing, footwear and should be able to lift 50lbs. These routes are for experienced paddlers. You must be a good swimmer and in good health in order to signup for these routes. You will be in and out of the river and must have the ability to navigate a canoe with 100 pounds of trash or more. Often you will be paddling into a headwind. Some canoe routes are over 5 miles long, thus you may be on the river for up to 6 hours. You may be on a route requiring you to portage due to river hazards or shallow conditions. As you are gathering trash, put items for landfill in one bag and recyclable items in another; and keep paint cans, electronics, tires or other hazardous materials separately in their own bag or in the boat. 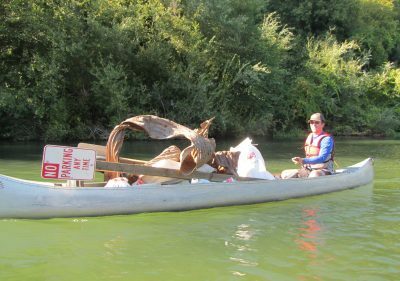 As you boat downstream in addition to gathering floating trash, stop at the beaches and look around for trash. Take it easy when loaded – your boat will be harder to steer – and keep trash low in boat to make it less tippy. If your boat is loaded, it might easier to walk boat down side of rapids if it pushes boats into bushes to avoid tipping and re-loading garbage! Once you get to your take out location remove all trash from your boat, pile trash in one pile, recycling in another and any hazardous items separately (paint cans, electronics, batteries, tires). These are the “Heavy Lifting” routes. This is where the largest percentage of trash is generated the day of the cleanup. You will be working alongside experienced teams and leaders. You must be able to lift upwards of 80lbs and be in excellent physical condition. You will be walking under bridges, along narrow trails and in and around heavy brush. 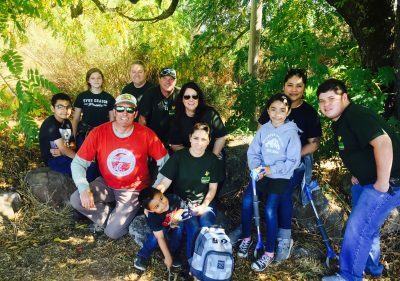 We will mostly be working to clean up abandoned homeless camps and areas around campsites. At a few sites we will be working with Homeless Outreach Service Teams and working directly with homeless individuals to help them cleanup their camps or haul away garbage they have collected. Only people signed up expressly to work with homeless individuals will be working in the active camps, all others will work to cleanup abandoned camps where people have moved out.